Doctors Jean Baptiste, right, and Inobert Pierre make morning rounds at St. Boniface Hospital. Baptiste says young people in Haiti grow up with little hope of escaping poverty. he first time Jean Baptiste visited Santa Santo Domingo in the neighboring Dominican Republic, he nearly cried. Baptiste, one of three Haitian medical doctors at St. Boniface Hospital, stares at his hands as he tries to explain what it is like to grow up in a place so poor that most Americans cannot possibly imagine it. It is even hard to dream, he said, when everyone around you is struggling to eat, and jobs are reserved for the fortunate few. Baptiste counts himself lucky. 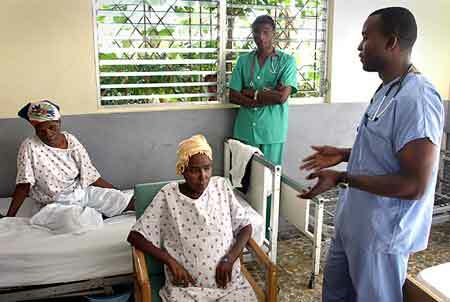 Each year, the only state-run medical school in Haiti accepts about 100 applicants. Five thousand students applied the year he was accepted. After working in a Port-au-Prince hospital, Baptiste, who is in his 30s and single, joined the staff of St. Boniface Hospital in Fond des Blancs three years ago. He lives in a room above the hospital and makes $13,200 a year. In a country where the annual per capita income is $250, he might seem wealthy. But he does not live the life of a doctor in the United States.